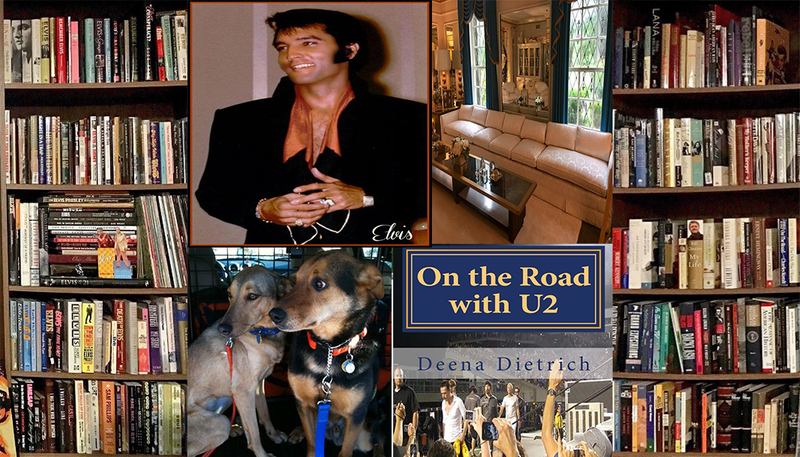 I have loved Brady Anderson (a close third behind Elvis Presley and Larry Mullen) for over 23 years. I have met him many times and gotten his autograph, but have never gotten my picture taken with Brady – until today. 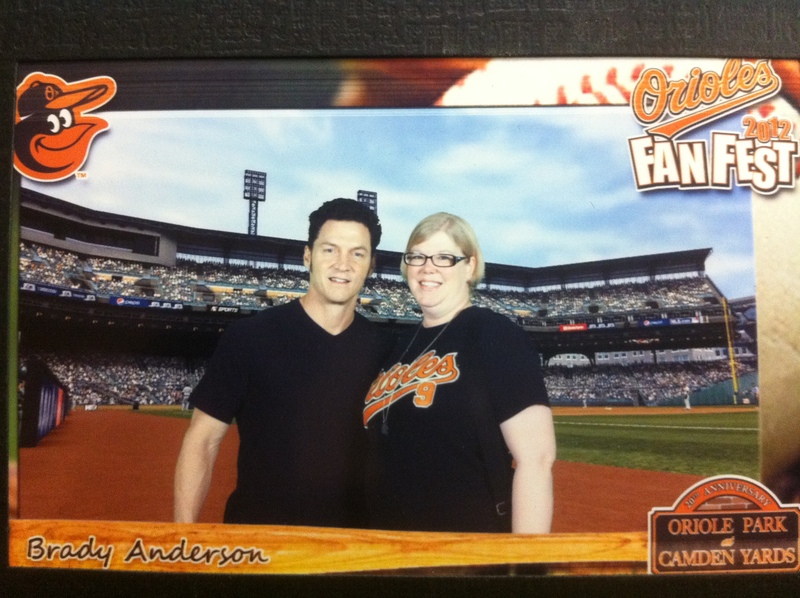 I went to the Orioles FanFest today because I knew Brady would be there. Although I didn’t feel the need to buy an autograph voucher for $15, I just figured I would somehow see Brady and get my picture with him. Just a few minutes after arriving at FanFest, my friend spotted Brady walking by. So of course I ran after him and followed him to the photo booth. I walked right up to him, we locked eyes and I said, “Brady! Hi!” He smiled and said, “Hi.” I said, “Are you going to be posing next?” He said, “Yes, posing, stripping, whatever.” Big sigh! 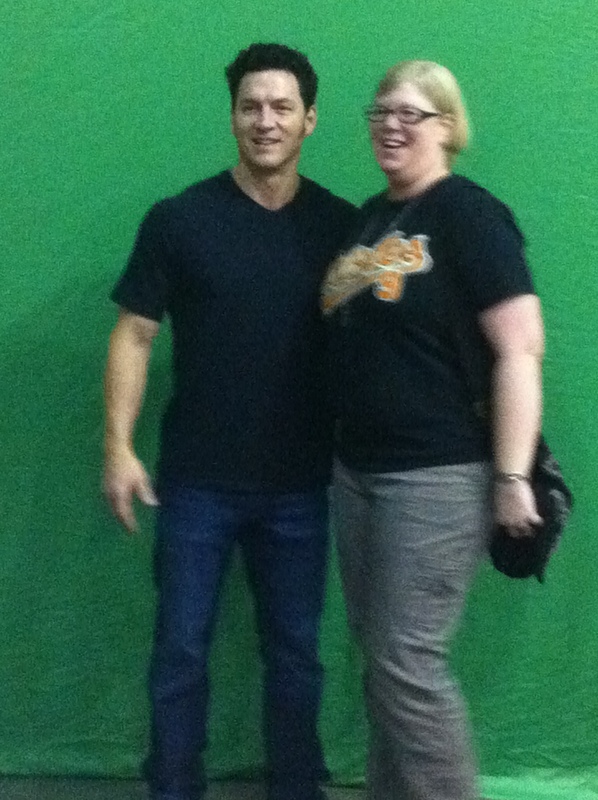 I got in line and over a half hour, I finally got my picture taken with Brady Anderson! I walked up to him and he said, “If you’re taller than me, I’m not going to take the picture.” I offered to squat down, but he laughed and said it was ok. 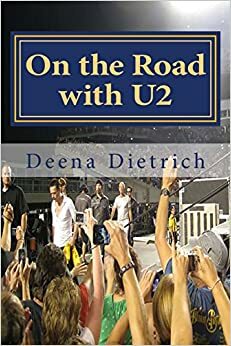 I then told him I had been a fan since 1989, I was very glad he was with back with the Orioles, and I looked forward to seeing him at the stadium. He said, “Thanks. That means a lot.” I was shaking and sweating for several minutes after, but at least I didn’t cry like I did after Larry hugged me. Brady Anderson came to the Baltimore Orioles from the Boston Red Sox in 1988. I was 16 and was instantly in love. I started my Brady Anderson scrapbook when Brady started in centerfield on Opening Day 1989. I have all the tickets from important games, every article about Brady from the Baltimore Sun, every Brady Anderson baseball card and many, many, many pictures. The first time I met Brady Anderson was on my 21st birthday, October 4, 1993. I went to this terrible bar he hung out at, so I could meet him. I talked with him briefly. The second time I met Brady was at Yankee Stadium in New York in 1995. I met him as he got off the bus. This was the first time I got Brady’s autograph. The third time I met Brady was in Cleveland in 2002 when he was traded to the Indians in the last year of his baseball career. I shook his hand in the parking lot after the game. The fourth time I met Brady was a few days later when the Cleveland Indians came to Baltimore. I arrived early for batting practice and stood in the front row. Brady looked up at me and said, “Didn’t I just see you in Cleveland?” I said, “Yes, but I live here in Baltimore.” The fifth time I met Brady was in 2004 at the luncheon when Brady was inducted to the Orioles hall of fame. This was the second time I got his autograph. The sixth time I met Brady was in Cooperstown in 2007 when Cal Ripken was inducted to the baseball hall of fame. Brady was warming up with the Iron Birds, and I had my Cal and Brady tee shirt on. I talked with Brady through the fence and asked him to sign my shirt. He said, “If you take it off, I’ll sign it.” Sigh! Today was the seventh time I met Brady Anderson, but the first time (in 23 years!) I have gotten my picture taken with him!